People who fetch up at the borders between Greece and Turkey are treated as if they were less than human, in unaccountable operations for which the European Union must take responsibility. 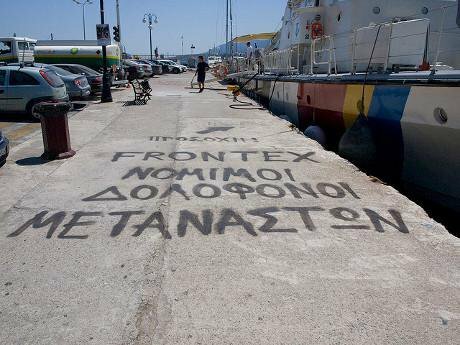 'Attention Frontex: permanent murderers of immigrants'. Flickr / John Georgiou. Some rights reserved. At midnight on 19 January, twelve refugees (nine children and three women) drowned during a push-back operation in the Aegean Sea. Survivors said their boat was near the Greek Island of Farmakonisi when coastguards intercepted it. The boat capsized when the coastguards towed it at high speed toward the Turkish coast. Rather than save the drowning refugees, however, the coastguards beat them so that they would not leave the sinking boat. This tragic incident is perhaps one of the most savage to have occurred at the Greece-Turkey borders (Aegean Sea coast and Evros land/river Region) but it is hardly isolated. UNITED for Intercultural Action has reported 952 deaths at the borders between 1994 and 2010. Since 2010 the toll has increased, with more than 300 deaths counted. The real numbers are probably much higher, because not every case is reported. In recent years most of the dead, among them many children, have been refugees from Syria and Afghanistan fleeing war and conflict. The increasing systematic and intensive push-back operations have been well documented by Pro Asyl and Amnesty International, among others. The Greek authorities have treated many apprehended individuals brutally, assaulting them on arrest and forcing them back into Turkey. It is these operations that either directly or indirectly result in deaths. While some individuals have died during them, many others have succumbed while trying to evade detection, following dangerous routes in unseaworthy vessels. Driven by the misguided belief that the social and political issue of refugee and migrant mobility can be solved with technical tools, the Greek and EU authorities have expanded surveillance at the borders. While the former already possessed extensive surveillance equipment (including patrolling vehicles and vessels, helicopters, planes, thermal cameras, binoculars and night-vision goggles), they have continued to update their inventory with the help of the EU’s External Border Fund (EBF). Between 2011 and 2013, Greece received €132.8m from the EBF towards new surveillance tools, such as thermo-vision vans, land-based radar and operation-and-coordination centres. The Greek authorities have also used national funds to construct a 12.5km fence, equipped with day-and-night thermal cameras, along the land section of the Evros border. Controlling borders used to depend on patrolling with as many vehicles and vessels as possible. Now, with the help of remote detection systems, the authorities can locate approaching refugees and migrants and use this information to deter and push back. The involvement of Frontex (the European Agency for the Management of Operational Co-operation at the External Borders of the Member States of the European Union) in border controls has also significantly increased Greece’s surveillance capacity. Frontex was first involved in Greece in 2006 and has maintained a permanent presence at the Aegean Sea since 2008 and in the Evros Region since 2010. In addition to contributing equipment and personnel, Frontex takes the lead in sophisticated surveillance mechanisms such as operation-and-coordination centres and geographical information systems. Frontex has also developed the EU-wide Eurosur (European Border Surveillance System), to establish continuous surveillance at the EU’s external borders with the help of drones or optionally piloted aircrafts and satellites. Eurosur was launched in December 2013 with the justification that it would be used in search-and-rescue missions—in other words, to ‘save lives’. It is not clear whether it was in use during the drowning of the twelve refugees in the Aegean. But the truth is that even when they receive distress signals the Greek authorities use them to locate and push back boats towards Turkish territory, instead of initiating search-and-rescue. The EU gives billions of euro to major defence and security corporations to develop Eurosur and other surveillance systems, such as drones, with the hope that these can keep the EU sealed off from refugees and migrants. Surveillance, however, cannot establish total control over border regions. It rather forces refugees and migrants to find new and often riskier routes. Before the fence was built, that stretch of the border was the most used, being the least dangerous. Now that that land section is ‘sealed’, many refugees and migrants cross the Evros River and the Aegean Sea at great risk of death. Some others have begun using the Turkey-Bulgaria route, previously unused and no less dangerous. As Eurosur becomes fully operational, we can expect refugees and migrants to be increasingly drawn to new sections of the borders which are most dangerous to cross. Technologically mediated push-back and deterrence operations violate fundamental human rights—including the right to life, the right to seek asylum and the right to protection from ill-treatment—as well as the United Nations Refugee Convention, which prohibits refoulement (the return of individuals to places where their lives or freedoms could be threatened). How, then, can the Greek authorities continue operations which so blatantly abrogate human rights? The answer lies in the indeterminate legal nature of border zones. In these liminal spaces, sovereign border practices reign supreme over human rights and refugees and migrants are abandoned to death. This is not to imply that human rights do effectively exist for refugees and migrants outside of the border zones, but rather to emphasise that the violations visited on them are concentrated there. Despite the systematic nature of the push-backs from the Greek territories, the authorities have denied their existence, claiming that officials only discourage refugees and migrants from crossing the border and notify the Turkish authorities of any interception. Diversion and deterrence operations at the borderlines also violate human rights and the principle of non-refoulement, while increasing the risk of death. Many people, including women and children, rush towards the Greek territories to avoid detection and lose their lives along these dangerous routes. Refugees apprehended by the Turkish authorities receive ineffective protection and inadequate assistance and risk being expelled to their countries of origin, where they would face the threat of persecution. As well as these deficits, even with the new Law on Foreigners and International Protection Turkey maintains geographical limitations on the protection it offers under the Refugee Convention, only extended temporarily to non-Europeans. Potentially, refugees can be resettled to third countries (mainly to the US, Canada and Australia) via the United Nations High Commission for Refugees. In practice, very few are resettled—most live in impoverished conditions and some, out of desperation, decide to risk their lives at the Greece-Turkey borders. Besides financially supporting Greece’s push-back and deterrence/diversion through the EBF, the EU is actively involved in the border operations through Frontex. Due to the agency’s secrecy, we do not have accurate information about the extent of that involvement, although at minimum its technical support has certainly facilitated them. Nor, however, is it clear whether Frontex can be held accountable for the human-rights violations. As the reports of the Parliamentary Assembly of the Council of Europe (PACE) and the European ombudsman demonstrate, there is a lack of transparency and accountability around Frontex. There is no effective complaints mechanism or independent monitoring system and, ultimately, the responsibility for border operations lies with the hosting member states. In addition, there is no mechanism to upbraid Frontex for the indirect, yet no less lethal, effects of its surveillance and research-and-development activities on refugee and migrant lives. The EU’s complicity in refugee/migrant deaths does not end with the EBF and Frontex, however. At a more fundamental level, the union has encouraged the Greek policy of push-backs and deterrence/diversions through its asylum policies. The Dublin II regulation mandates that an individual’s asylum claim must be processed in the first EU country of arrival and the Eurodac database was developed in 2003 to enforce this. The database stores the fingerprints of refugees when they are first apprehended at the EU’s external borders, so that should they claim asylum in another member state they can be sent back to the first. As a result of Dublin II, member states at the periphery of the EU have faced disproportionate pressure from asylum claims over the years. The Greece-Turkey borders operate through a complex set of technical, il/legal and institutional apparatuses which systematically kill refugees and migrants. Although the European Court of Human Rights suspended Dublin II transfers to Greece in 2011, because of the inhuman conditions in its detention centres and the failure of the Greek asylum system, this suspension has had little effect. Those refugees and migrants who have somehow succeeded in entering Greece are confronted by an ineffective asylum system, prolonged detention (up to 18 months) in degrading conditions, economic crisis, continuous police sweep operations and abuse and racist violence, yet they are trapped as a result of the border controls at Greek airports (supported again by Frontex) and the Greece-Italy sea route (in Patras and Italian sea ports). The newly adopted Dublin III regulation is also unlikely to have much impact, as it neither changes the principle of first country of asylum nor removes the de facto border controls inside the EU. The failure of the EU to allocate a fair share of responsibility for refugees among member states and the continued existence of border controls inside the ‘borderless’ Schengen area encourage Greek authorities to develop ever-harsher methods of stopping refugees and migrants at the borders. Push-backs and ill-treatment of refugees and migrants at the Greece-Turkey borders must end. After an independent investigation, border authorities—including the entire chain of command involved in these activities—must be punished. But these remedies won’t be enough to end the deaths. The Greece-Turkey borders operate through a complex set of technical, il/legal and institutional apparatuses which systematically kill refugees and migrants. To stop the deaths we must challenge how these apparatuses function: the technical approaches to the social and political issues of refugee and migrant mobility and rights, the indeterminate legal status of the border zones and the lack of transparency and accountability regarding border operations—which, in practice, amounts to suspension of human rights for refugees and migrants—and the complicity of the policy-makers. But for such efforts to succeed, we must first accept that refugees and migrants are equal human beings, whose lives are no less valuable.